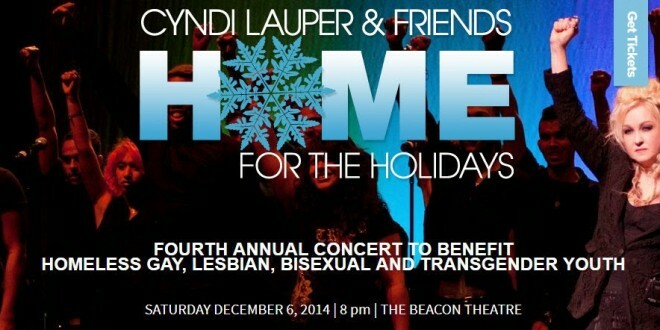 NEW YORK CITY: Cyndi Lauper To Host Benefit Concert For Homeless LGBT Youth - Joe.My.God. Cyndi Lauper’s True Colors Fund today announced annual “Cyndi Lauper & Friends: Home for the Holidays” benefit concert on Saturday, December 6th at New York City’s historic Beacon Theatre to help raise awareness about lesbian, gay, bisexual, and transgender (LGBT) youth homelessness and funds to support the True Colors Fund’s work to address the problem. Cyndi Lauper will be joined on stage this year by 50 Cent, Natalie Maines, Patty Griffin, Salt-N-Pepa, Sufjan Stevens, Emily West, STRFKR, Liv Warfield, Hoda Kotb, and co-hosts Rosie O’Donnell and Laverne Cox. Additional guests will be announced soon. 50 Cent! That’s interesting. Tickets go on sale here tomorrow. The Beacon Theatre is on the Upper West Side and is one of the most gorgeous venues in New York City.